It is time once again for our biennial Delegate Assembly, scheduled for July 2-6 in Kansas City. 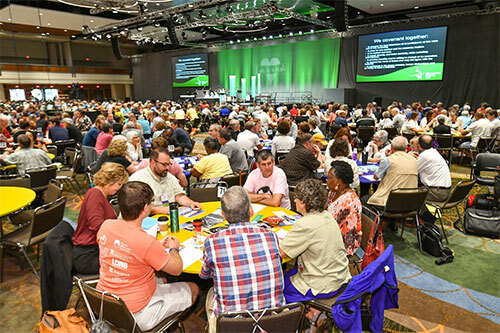 The Delegate Assembly provides the opportunity for our MC USA family to assemble for worship, fellowship, prophecy, relationship building, understanding and deepening our commitment to Christ and each other. In 2019 we will focus on equipping our church leaders for mission while we discuss major issues of policy and discern next steps for the national conference. It is important that the voice of our constituency be heard as we gather together from all parts of the church. The Delegate Assembly is your opportunity to not only speak to the establishment of general policies and the development of programs to carry out those policies. 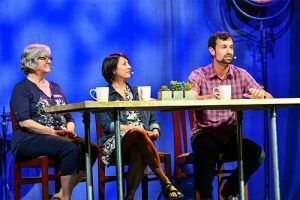 But it is an opportunity for you to connect with and listen to the various members in our great and diverse denomination. Come see and hear what is next for MC USA. Join in helping our denomination live into its call. Meet Mennonites from all over the United States and learn how they are living into the commitments of the Journey Forward process. Select your delegates now! Refer to the Information for Delegates to learn about the delegate selection process and registration. Other materials for the delegate assembly will be posted on this webpage as they become available. In addition to delegate business, the delegate session at Menno-Con 19 will be featuring a teaching session each day with Tom Yoder Neufeld. Tom is Professor Emeritus from the University of Waterloo. He is the author of the commentary on Ephesians part of The Believers Church Bible Commentary series. The delegate session will also feature stories from congregations across our denomination that give life to our Renewed Commitments from the Journey Forward. I hope to see you in Kansas City this summer.